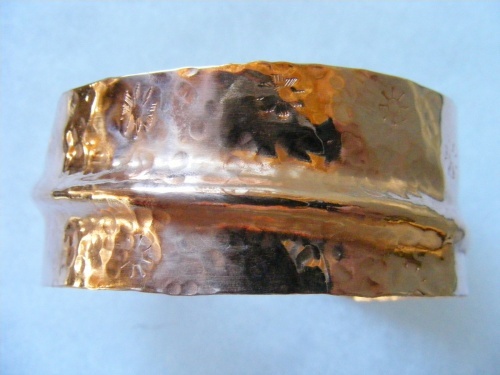 This copper cuff has been hammered to make the piece pick up sparkle and then stamped with a few bursts here and there just to add more spark then, it was fold formed to make it a bit more unusual. Copper is said that when worn helps with arthritis. Piece is unsual and pretty comfortable to wear. Will fit wrists from 7" to 8 1/2" - measures 1 1/4" wide.